This is the Alchemist Tower 2 inch. The Copper Reflux still tower. It is 2 inches in diameter. Made in the USA from PURE Copper. We have manuals and videos on youtube about this. It can be both a reflux still or pot still. Handmade with care. Made in the USA. Will also fit on any of your 2″ opening boilers. Let me know what connection you need. I can make it fit any size, or sell you a connector. Sold just the tower alone! For shipping please select from drop down menu USA or INTERNATIONAL below. It uses pure copper mesh packing material. Comes with mesh inside. This ADJUSTABLE REFLUX distillation tower WILL PRODUCE ANYTHING FROM DISTILLED WATER TO ESSENTIAL OILS, MEDICAL ALCOHOL AND UP TO 95% ETHANOL. 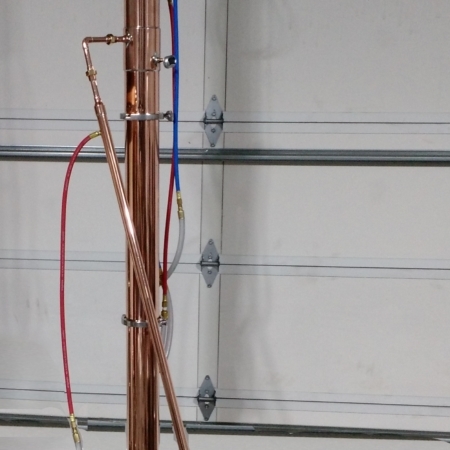 THE ALCHEMIST MOONSHINE STILL CONSISTS OF ALL COPPER, TWO INCHES IN DIMENSIONS.WITHOUT THE EXTENSION, ITS LENGTH IS 28 INCHES. ALL THE FITTINGS ARE BRASS FLAIR FITTINGS. IT COMES WITH ONE THERMOMETER. The alchemist distillation tower pure copper mesh has an excellent surface to volume ratio, it is even better than 3/16ths raschig rings. 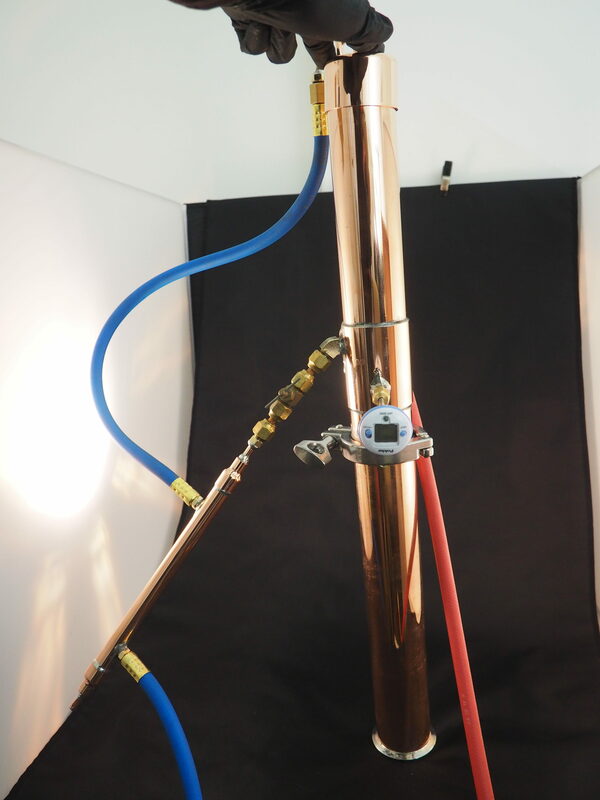 The alchemist distillation tower comes with four rolls of copper; the alchemist with the extension comes with 12 rolls of copper. The reason copper has been used for distilling, is because it removes the impurities from raw materials, etc wine, sugar mash, corn and so on. The condenser is the heart of the still. It’s a double helix copper coil, ten inches in length, all vapors that form during the boiling of the wash condenses against the cooling coils and turns into a liquid. 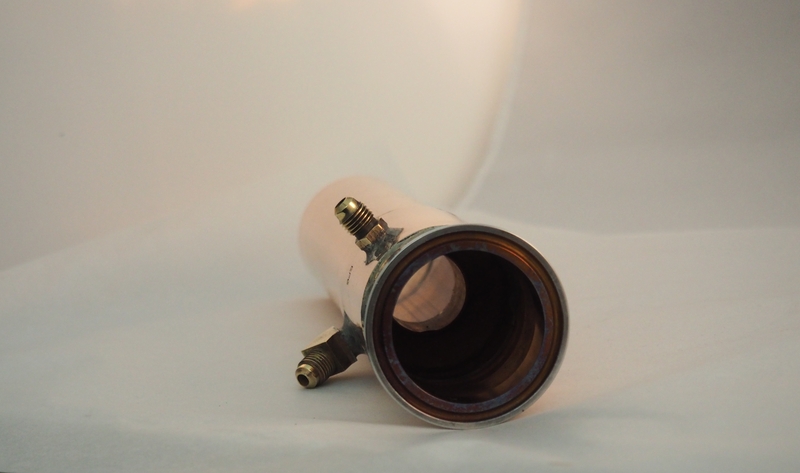 The Reflux dividing head collects all the liquid from the condenser. It also allows the liquid to either flow back into the reflux column, depending on the control valve setting. By adjusting the reflux control valve, the dividing head can pass some of the liquid back to the reflux column. We can achieve a double, triple, or multiple distillation. Just under the reflux divider collection, is the digital thermometer. Its position will allow it to read the temperature of the vapor just before it enters the reflux divider, and on its way to the condenser. The temperature is crucial in telling us what distilling products have been produced and what percentage. Broadly speaking, the product being produced can be catalogued as heads, hearts and tails. The reflux distillation column is the workhorse of the Alchemist Still. This is where the ratification takes place. The vapor from the boiler passes through the column, to the dividing head then on unto the condenser where it condenses and turns the vapor into a liquid. This liquid then falls into the reflux divider. When the control valve is fully closed this liquid falls back into the reflux column but not right down into the boiler as the pure copper mesh restricts it from falling downwards. The rising vapor from the boiler now heats this liquid again to its boiling point. It is evaporated again and gets carried to the condenser. However every time the vapor condenses the alcohol percentage increases. This condensing / heating/ evaporating cycle allows us to perform multiple distillations within one process. The Alchemist Still comes in two sizes. One being a pot still and an added extension if needed for high proof alcohol. They call this HYBRID STILL or LIQUID MANAGEMENT STILL, or FORCED REFLUX. 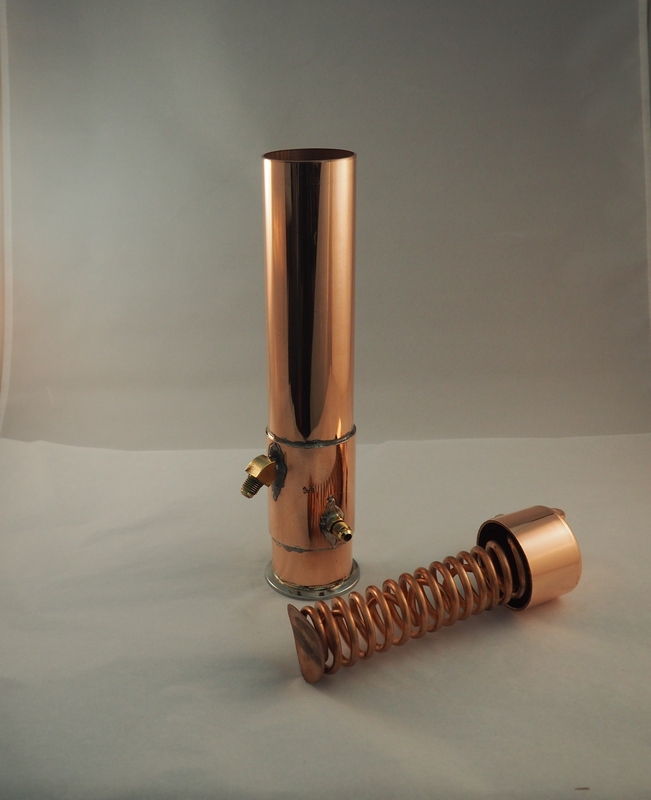 You might have noticed the reflux column the condenser, product cooler and even the column packing are all constructed from copper. The main reason is copper acts as a catalytic to reduce some unwanted compounds like sulfur. This is the main reason copper is used in all big distilleries. And also in gourmet kitchens. Also, the heat is distributed evenly and retained. 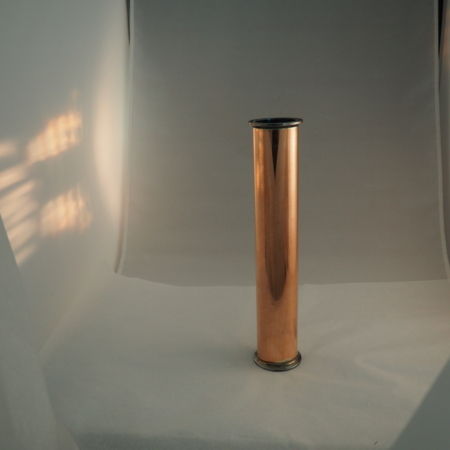 Copper has better properties than stainless steel. Copper does not leech nickle into the product which a few people are allergic to. The unwanted compounds like sulfur attaches to the pure copper mesh. You will see this as a black tarnish on the copper mesh. To clean this, place one tablespoon of citric acid into one gallon of lukewarm water for 15 to twenty minutes You will notice that the mesh comes back to its shiny state. Then to neutralize use baking soda. One teaspoon to a gallon of lukewarm water. You can leave this overnight.